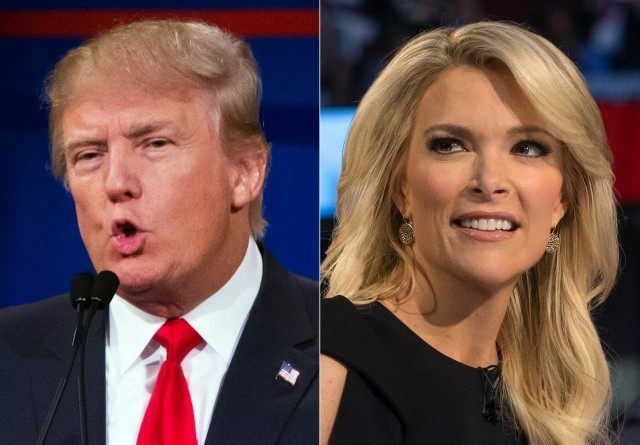 The ever-combative Donald Trump used his Twitter account Monday night to re-launch attacks on both his Republican presidential rival Jeb Bush and his media rival, Fox News anchor Megyn Kelly. Kelly, who is just returning from a two-week vacation, was accused by Trump of being “off her game” and “afraid. Trump also mocked Kelly’s “unscheduled vacation.” This is a reference to their pre-vacation feud that began during the Fox News debate. With her withering debate questions, Trump (and many others) believe Kelly singled out Trump for destruction. Immediately after the debate, Trump harshly criticized Kelly, which led to a three day media furor. Kelly then left for what she said was a scheduled two week vacation. Although both Kelly and Fox News insist the vacation was long-planned, the timing and length of the vacation allowed her critics to claim she was getting out of Trump’s line of fire. The billionaire businessman then turned his attention to Jeb Bush, who made a campaign appearance at the Mexican border Monday. Trump mocked Bush for shying away from his last name and his admittedly bizarre attempt to claim his use of the term “anchor baby” was aimed at Asians and not Hispanics.